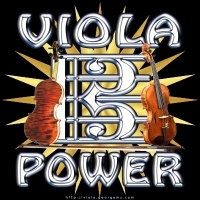 This bold “Viola Power” statement, along with the great viola and alto clef graphics, might be just what you need to find yourself more, well… “empowered”! And if not you, then the violist in your life, whether student, teacher or pro, will love the gift of any of these many items! Buy this design now, exclusively from Bratsche’s Viola Bazaar, on quality apparel and giftware items including t-shirts, hoodies, tote bags and mugs.